Acne is considered a disease that affects your skin, to be more specific your skin’s oil glands. Basically oil carries dead skin through the pores to the surface of the skin and when these pores clog up a pimple is formed. Everything gets clump together and the bacteria in the clog causes swelling. Pimples can be formed not only on the face, but the neck, back, chest and shoulders as well. Acne usually affects teens and young adults although older adults still struggle with the occasional pimple. Whiteheads: They are under the surface of the skin. Blackheads: They are usually on the surface of the skin in your pores look black color. Pustules: They are usually a red bump with pus on top. Why did I get Acne? You are not being punished don’t worry. It is believed Acne is caused either by hormonal changes in the body (hence teenage Acne, Pregnancy and/or Birth control pills) or from having skin that produces too much oil. If your parents had Acne you will most likely get Acne, if you wear greasy make up you will most likely get Acne. Having an oily face is one of the main causes of Acne and one of the things I address thoroughly here, so keep reading. Now we start looking for a product and create a treatment get rid of Acne, Scaring and Dry skin. 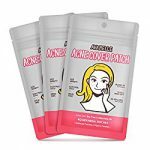 First we need to talk about the most common types of Acne products, once you have an understanding of what is what we can start testing, remember no two Acne products are alike and if one worked for a friend it does not mean it will work for you. 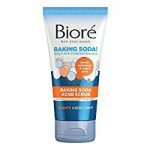 In here I will list the best over the counter Acne products. You will see some products below, to see the full list of product reviews check out the Acne Products page. Benzoyl Peroxide is the leading chemical in the most popular Acne products. It basically kills the bacteria on your face and prevents it from clogging your pores. It comes in 1%, 3%, 5% and 10%. The higher the percentage the stronger it is, but also the bigger the chance it will dry and burn your skin. Take this into consideration when choosing a percentage based on how sensitive your skin is. See Red/Dry skin for information on this. 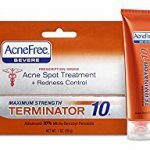 Acnefree Spot Treatments Terminator 10 Review – Pretty good for spots or face, if you can handle the 10% Peroxide. 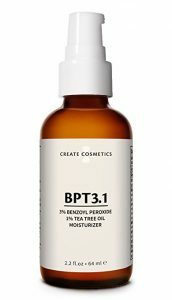 Create Cosmetics BPT3 Acne Treatment Review – A great product for those looking for a more mild 3% peroxide with some natural ingredients like tea tree oil. Humane Acne Treatment Body & Face Wash Review – Excellent 10% Peroxide wash, worth the try, very effective. Clean & Clear ADVANTAGE 3-In-1 Exfoliating Cleanser Review– It’s a 5% Peroxide treatment and wash, recommended for more sensitive skin or if you want something more mild, but still very effective. Just as I mentioned just because two products have the same Benzoyl Peroxide percentage does not mean they are the same. Also take this into consideration, a 10% Peroxide on one product can do nothing for you but cause dryness and burn your skin while 1% Peroxide of another clear you in days. This is the part where people get discouraged, they try a product for 2 weeks see no results and give up. You must try a product for at least a month before calling it quits on in and moving on. If it seems like Benzoyl Peroxide is not doing it for you, you can try our next chemical. Yes, I know what you’re thinking, acid!? It is an acid, most commonly 0.5%, 1% and 2% to be exact, this is the second most effective chemical when treating Acne. It burns the bacteria killing it and exfoliates your face in process. Products with Salicylic acid can be used alone or with Benzoyl Peroxide as part of your treatment. While it is an effective chemical do note that it can create some dryness or redness if you have sensitive skin. 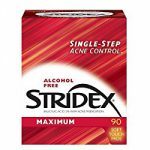 Stridex Strength Medicated Pads Review – These come in pads which make cleaning nice and easy, 2% Salicylic acid. 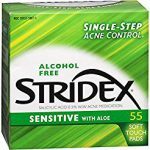 Stridex Medicated Pads Sensitive Review – Same wonderful pads, less abrasive on your skin, 0.5% Salicylic acid. 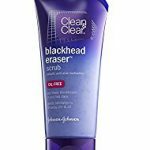 Clean & Clear Blackhead Eraser Scrub Review – If you are still having problems with whiteheads and blackheads this scrubber does wonders for you, is still one of my favorites and most effective, 2% Salicylic acid. Humane Clarifying Toner Review – Fantastic toner for those looking for another option, 2% Salicylic acid. While the products above are important it is also important to have good products when washing your face and body. A good body wash will help get rid of the bacteria clogging your pores. This is an excellent products for keeping your skin clean. 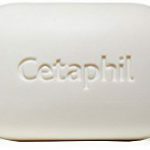 Cetaphil AntiBacterial Cleansing Bar Review – This soap is not only gentle it is antibacterial, great for face and body, kills bacteria without drying your skin. 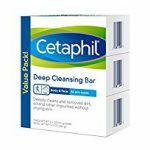 Cetaphil Deep Cleansing Bar Review – A great and equally effective alternative to the Antibacterial soap. Some other interesting products I came across and had great success with. Nexcare Acne Absorbing Cover Review – Chemical free covers that absorb oil and pus, you read that right. 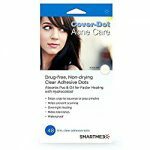 Cover-Dot Acne Care Absorbing Patch Review – Chemical free patches that absorb oil and pus, thinner and more discreet. Avarelle Acne Care Patch Review – With a hint of Tea Tree & Calendula to help inflammation. Aqua Glycolic Facial Cleanser Review – Exfoliate, hydrate and clean your pores. Glycolic Acid 30% Gel Peel Review – An at-home chemical peel, excellent if you’ve tried everything, for acne and scars. 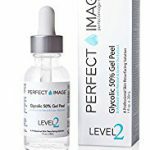 Glycolic Acid 50% Gel Peel Review – Another at-home chemical peel, much stronger, for experienced users only. 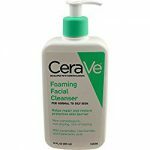 CeraVe Foaming Facial Cleanser Review – Great wash alternative for those who do not want harsh chemicals on their skin. 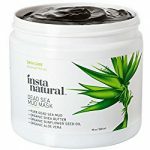 InstaNatural Dead Sea Mud Mask Review – A wonderful mask for oily skin, wrinkled, acne prone skin, 100% natural. 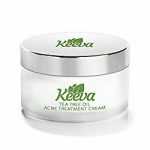 Keeva Acne Treatment Cream Review – uses Tea Tree oil as the main source, a great natural product. 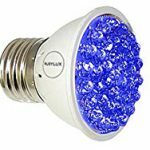 RubyLux Blue LED Bulb Review – Blue light therapy is proven to kill bacteria helping with acne. So you found great products for clearing your skin, but want some tips on dealing and preventing Acne? Wonder no more, below are some tips and tricks to dealing with Acne, these are things I still do and found throughout my research. Don’t touch your face, you have oily, dirty hands (no offense) and touching your face with dirty hands will transfer the dirt and oil to your face. Use brown napkins to keep your face dry, those napkins you see at Starbucks and Chipotle are great for drying your face, you can actually see the oil on them once you dab them on your face, I always carry a few of them with me at all times and just dry my face throughout the day. I ran an experiment where I didn’t dry my face and saw pimples formed the same night, every time I didn’t dry my face pimples formed. Keep your skin dry! If you don’t want to use the brown napkins you can purchase drying sheets as well, they are wonderful and more discreet Oil Absorbing Sheets. Use Only Water based make up, with oil based you are… well, you are putting oil on your face increasing your chance of clogging, that is a no, no. If you exercise wash your face immediately after working out, too much sweat not only produced from your pores, but also sweat that dripped down from your hair (if you use hair products also dead hair skin cells) will clog up in your pores forming pimples. Use a small amount of your favorite Peroxide and rub it in the pimple in an up and down motion a few times, repeat with a left to right motion. Be gentle, but put some pressure this will push the peroxide inside the skin and start fighting the pimple before it fully surfaces. I’ve stopped many pimples from forming into that puss filled state using this method. Before you go to bed put a small bead of your favorite Peroxide on a pimple, covering it completely. Overnight the peroxide will penetrate your skin and fight the bacteria under it. Make sure you fully clean the area, just wash your whole face while you’re at it. Use gloves or at least put finger gloves in the fingers you will use to pop the pimple, this way the dirt and grease from your fingers wont contaminate the area. Do not use your nails! use your fingers’ pads to put pressure, using your nails will damage your skin and make the pimple and surrounding area worse. Stop applying pressure when blood comes out, as soon as the pus is out and blood starts, stop, doing more will create a scar. Make sure you remove all pus and clean the area, you don’t want that bacteria to settle somewhere else and create another pimple. Put a bead of your favorite Acne product on the area. After you wash your face (hopefully with one of the great soaps I recommended) remember to scrub your face thoroughly, you are trying not only to remove oil or Acne product, but also dead skin cells. Always pad dry your face, preferably with a small cotton towel, make this towel your face only towel and try to keep it as clean as possible. When applying your Acne product do not just put the product on your face and let it dry, put it on your face and massage the area in a circular motion until it dissipates in your skin, this way you are ensuring it is getting in your skin rather than just putting it on your face like a coating. So you found great products, got a great treatment and learned new tips on treating Acne. But now we must face another challenge, unfortunately some of that picking and scratching on pimples have created a few scars on our skin, do not worry! the Scars page will provide lots of information on dealing with all types of scars.